While global media talked about Russia’s potential isolation from the rest of the global community in 2014, Russians were forming their own attitude to the outside world. For many years, the Levada Center has been monitoring public opinion in Russia on a regular basis. It measures the ratings of top officials and identifies the main assessments of ordinary Russians regarding the economic and political situation. In addition, respondents are invited to answer the question of which events they believe to be the most important on a monthly basis. A comparison of the 2013 and 2014 results shows that serious changes have occurred in the “informational” consciousness of Russians over the last year. At the end of 2013, the responses to that question varied widely. The typhoon in the Philippines was the key topic of interest to Russians in November 2013, and in December 2013 it was the Olympic torch relay. 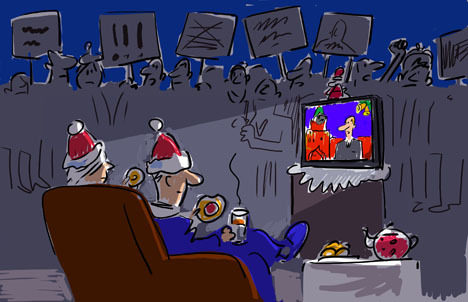 Other noteworthy events included floods in Eastern Russia, the Euromaidan demonstrations on Kiev’s Maidan Square in Ukraine, the pardoning of imprisoned oligarch and ex-Yukos head Mikhail Khodorkovsky, the death of Nelson Mandela, the birth of a son to Russian pop diva Alla Pugacheva and her young husband, and the riots in the Biryulevo district of Moscow. A number of these events also attracted the attention of people from around the world – in this respect Russia did not differ much from other countries. A year later, that picture has changed dramatically. By December 2014, the Russian population was disconnected from the global information agenda. The top 10 events of December, as listed by Russians, almost exclusively had to do with the situation in Ukraine or the confrontation between Russia and the West. But the main event – mentioned twice as often as any other event – was the collapse of the ruble. All other events were pushed into the background. Calm and inclusion in the global agenda were supplanted by anxiety and introversion. Russians first expressed interest in events in Ukraine after Euromaidan in November-December 2013. By January-February 2014, “the unrest in Kiev and other Ukrainian cities” had attracted as much attention as the pre-New Year terrorist attack in the southern Russian city of Volgograd (about 50 percent in January) and the Sochi Olympics (more than 60 percent in February). In March-April, the main event was Crimea’s annexation by Russia, often referred to by Russians as the “reunification” or “return.” Russians turned their attention almost exclusively to the events in and surrounding Ukraine throughout the spring, summer, and fall. Seven of the 10 main events in March, April, June, and August, eight of the 10 in July and September, and six of the 10 in November and December were linked to Ukraine. Against that backdrop, the Ebola virus, the referendum on Scottish independence, and various international summits went virtually unnoticed. Ukraine and the subsequent confrontation with the West overshadowed everything else for many months. However, the ruble’s decline and oil prices again eclipsed the Ukraine agenda in November-December. Why has the global agenda ceased to be of concern to ordinary Russians? The structure of the Russian media audience has a substantial role to play, of course. In Russia, 90-95 percent of the population learns about domestic and international events on television. For half of Russians, televised news is virtually their sole source of information. Four main TV channels have the largest audience (Channel One, Rossiya, NTV, and Rossiya-24) and are either directly or indirectly controlled by state-run structures. No more than 10-15 percent of Russians watch independent Russian media channels. The state-run TV channels started to actively broadcast the goings-on in Ukraine almost immediately after Euromaidan. By the spring, the majority of newscasts were taken up by Ukraine. According to Arina Borodina, one of Russia’s most authoritative TV critics, no other political campaign has ever garnered such powerful media coverage – not even the presidential elections or the war with Georgia in 2008. But despite the excess of information, Russians admit that they are not too well-versed in what is happening and that they only listen to the news with “half an ear.” They are not particularly interested in the details and are not willing to seek out alternative points of view. A mere 12 percent of Russians say that they often hear a point of view that differs from the official one, while 46 percent say they sometimes hear alternative points of view, and 37 percent say they have never heard any other point of view. However, it would be wrong to place the blame for self-isolation squarely on the shoulders of the state-run Russian media. The emergence of this trend was largely facilitated by the general population’s detachment from everything that happens outside of a small circle of family, friends, and acquaintances. According to numerous public opinion polls, the vast majority of Russians (more than 65 percent) are completely indifferent to international conflicts (in Syria, Israel/Palestine, Libya, Egypt, etc.) and to elections in the United States, Ukraine, and other countries. The imminent economic crisis, which ordinary Russians are already starting to feel, will in all likelihood only compel Russians to turn further inward and focus on their own problems. This, in turn, will merely deepen the country’s self-isolation and delay Russia’s integration into the international community. Denis Volkov is the leading sociologist at the Levada Center. The column is based on statistics from the Levada Center.